Pamper yourself in this upscale condo featuring top-of-the-line appliances and luxury furnishings throughout. Amazingly well-supplied, you will find everything to meet your needs here, from an assortment of baby supplies to a wide range of cookware to free long distance calling. 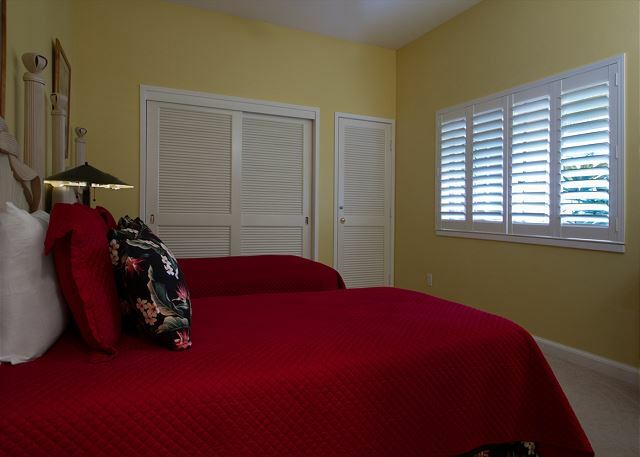 Beds and linens are of the finest quality to ensure the ultimate comfort. Unit A104 has a fresh, open atmosphere with gorgeous tile flooring, vaulted ceilings, and wide windows displaying lovely scenery of a garden landscape highlighted by brilliant sunsets in the evening. 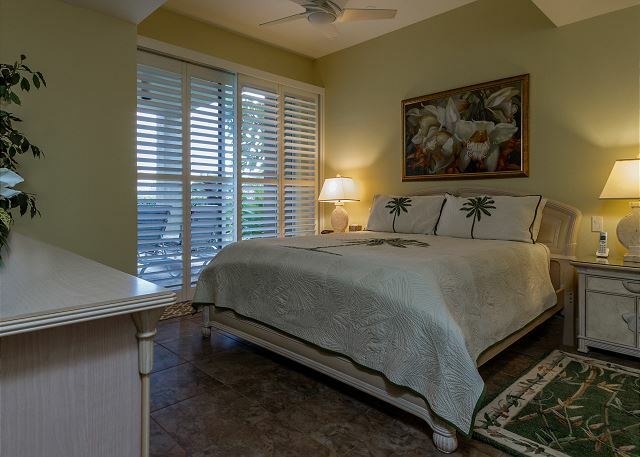 Recent upgrades include attractive tile flooring; fully renovated bathrooms including an extra-deep tub in the master; a deluxe refrigerator; a jumbo-size washer/dryer; and updated patio furniture. This practical unit features one of the best locations in the complex, situated close to the property's luxurious lap pool and jacuzzi as well as the barbeque pavilion, while at a comfortable distance to be shielded from noise. Walk to the Hilton across the street in approximately 7 minutes to find a variety of attractions including restaurants, shops and spa facilities. Also close by is a scenic trail that leads to the white sandy beach at A-Bay. 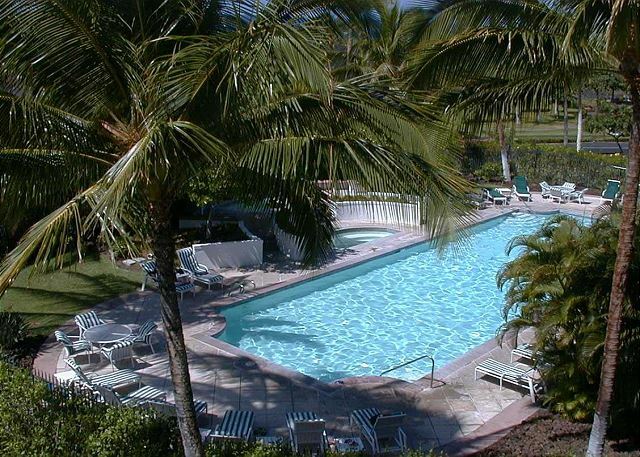 Make the most of your Waikoloa Beach Resort vacation in this superbly maintained, very comfortable and well-placed Vista Waikoloa condo. This is a great location with beautiful landscaping. Lots of green spaces. Large living areas and nice BBQ patio. I,along with my Daughter and 20 month old Grandson stayed in this beautiful condo for 6 nights.We were immediately impressed by the spaciousness and cleanliness of the condo. Everywhere appeared well maintained,both within the unit,and the surrounding gardens. The swimming pool area was very pretty, and the heated pool was much appreciated by my Grandson who absolutely loved splashing around in his swimming ring. Having stayed in a couple of the other condo complexes I found the Vista location my favourite. 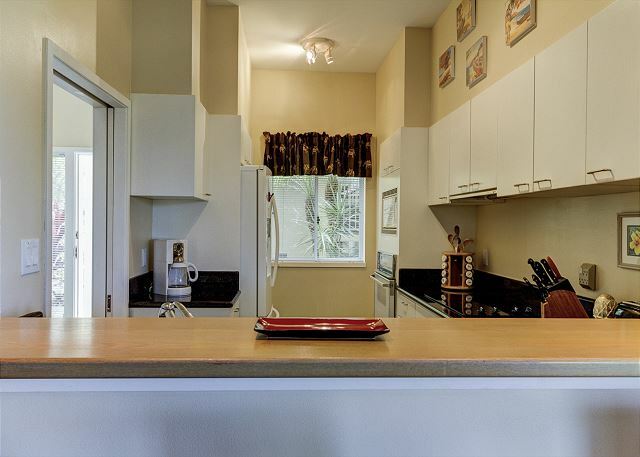 The condo is a short walk from both the beach and the shops.If you like walking or running there is a very scenic coastal path nearby,and lots of paved paths to explore. Peggy was great to communicate with,she is very friendly and quick to respond to any questions . I would definitely recommend this condo as a wonderful base for a holiday, we had a fantastic time here,and will certainly be in contact with Peggy when we return to this area again. The condo was very clean, layout comfortable, location reasonably convenient, decor pleasing. Only drawback is proximity to the main road through the resort. Could not leave the windows open at night because of the traffic noise. Condo was perfect for us 3 adults. Enjoyed breakfast and dinner out on the shaded patio. Plenty of places to walk to while the guys enjoyed golfing nearby. Pool and jacuzzi’s were peaceful and relaxing. Plenty of thick new towels. Master bath was large and bed was comfy. Enjoyed the cold Diet Cokes left in the fridge upon our arrival! Would definitely stay here again! Thank you for the nice comments -- we are glad to hear that you were comfortable here. Hope to have you back for a future stay! Peggy was most responsive. Unit is decorated with an interior designer's eye for class. Loved it. This was the 4th year that we stayed at Vista. Lovely grounds, well maintained. Excellent location. Everything we enjoy is nearby. I added to my pix of the ever present Nene family. We needed to make plans at the last minute and the property manager Peggy was the reason we booked and will come back next year... she was prompt, thorough, and responsive with all of our questions and made the booking process easy. The unit has great showers. We were there for 3 weeks and a little hesitant about not having towel service but the high-end washer/dryer and provided laundry pods made it easy and we ended up liking the privacy of no one coming to our unit. Initially the pool wasn't a big selling point for us as we love the ocean, however in the evening it turned out we really enjoyed the salt water heated pool that was immaculately kept. The grounds are unbelievably well kept because they are working on it literally every day! The kitchen and entire unit is well equipped in every way. We preferred leaving the windows and sliding doors open for the breeze but there's A/C if you need it. Very private. The condo is lovely with great amenities. there were only 2 of us so we only used the very comfortable bed in the master. The property is very clean and in a beautiful location. There was easy walking to the marketplaces and to A-Bay and right across the street from the Hilton. We stayed on the road most days and were generally just there to sleep and get ready in the morning. LOVED having the washer and dryer and the customer service from Peggy was outstanding. Perhaps the only negative was some road noise as it is a corner ground unit and there are 2 streets within view. The unit is absolutely loaded with beach chairs, an umbrella, snorkel gear, toys and beach towels!! We loved our stay and sorry we only had 8 nights! 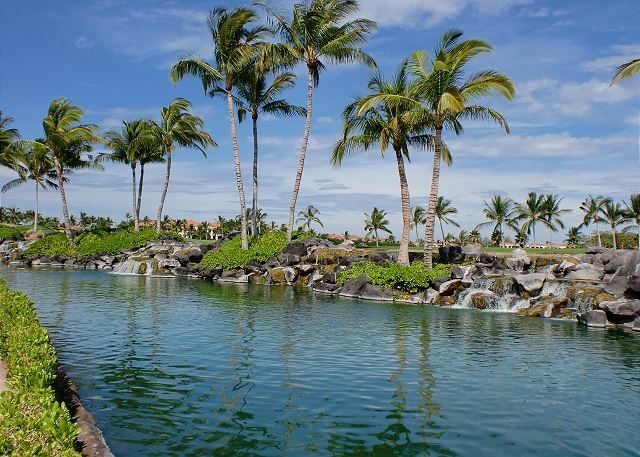 Would definitely book with Waikoloa Realty again!! It was a pleasure to work with you, and we hope that you will stay with us again on a future trip to this island. Thank you for your feedback! Peggy was very helpful at Waikoloa Realty and we really appreciated all her help. This unit is in great shape and the location is perfect. 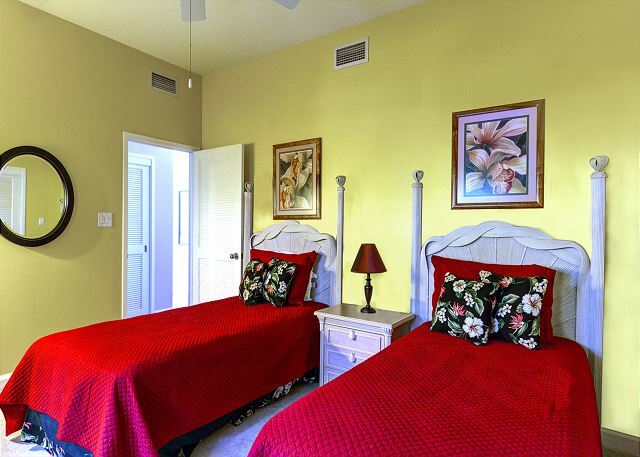 The pool is steps away and the beach and shops are within walking distance. 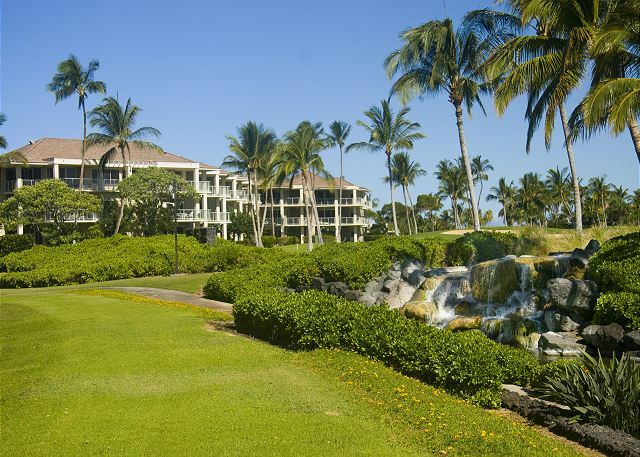 We have stayed at Waikoloa Vista in the past and we think these units have the best location. We also liked that we were on the first floor. WE were incredibly happy with our suite. Every room has fans so air conditioning was never needed. The cross breeze in the main living area was perfect. 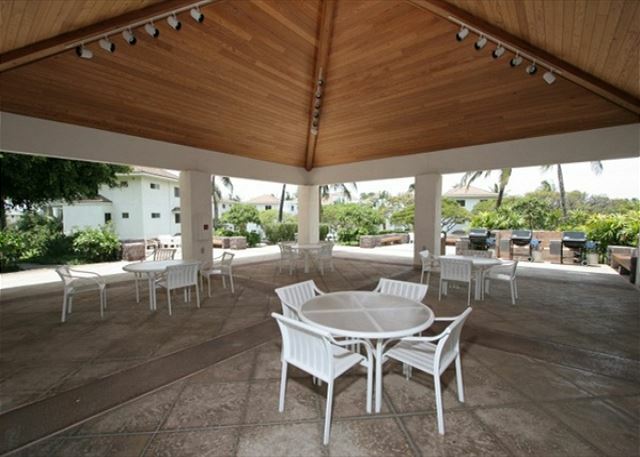 The outside lanai was large and well equipped with comfortable seating and an eating area. Due to the design of the building, each suite is private, with no views of other suites. Everything that was needed in the suite was provided. The amenities in this resort were top notch. The pool was well looked after and quite large. The business center and work out room was well equipped and clean, and the BBQ area was large with 5 Weber BBQs. Lots of seating around this area. The condo was perfectly situated for both local conveniences such as the 2 markets within easy walking distance, as well as the other hotels restaurants and bars. Also, it was well situated for exploring the rest of the island. We would highly recommend this property to anyone. Beautiful elegant and the best kitchen with everything needed to cook. 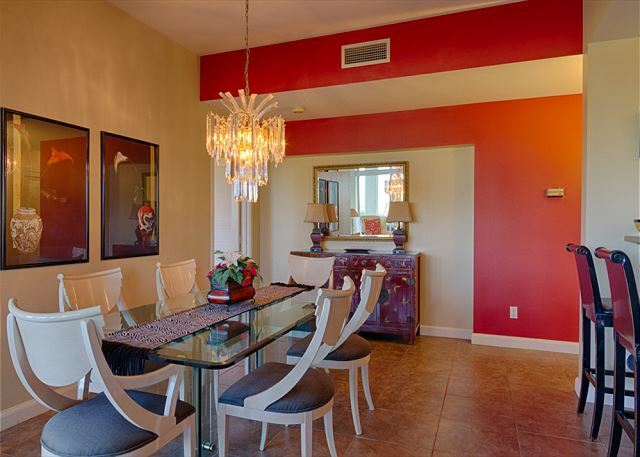 This condo was superb, definitely exceeded our expectations. The unit was very clean and well maintained. It had nice tile floors and all the rooms had fans which was great. The kitchen literally had everything from utensils, cups, bowls, pans to spices. They even had dish washer soap! They also had a really nice laundry machine and dryer in the unit which was a huge plus. It was very convenient to wash our clothes, swim suits and towels, which we can't do at hotels. They didn't have laundry soap and it would be efficient if you brought some, otherwise you would have a lot of left over. We brought our own snorkeling gears but they have some swim fins and couple other gears in the closet. We really liked the location, quiet and peaceful. Also, it was close enough to walk to the markets and shopping center near by. We enjoyed walking around the neighborhood in the morning. This condo surely spoiled us and we would definitely stay here again! Thank you for your kind review. We are happy that this unit worked out for you and that you enjoyed your visit. There is a large container of laundry soap inside the washer-dryer closet that the owner supplies. We will make sure that this is visible to guests in the future. Everything about this property exceeded our expectations. It was spacious, clean, and had a well-appointed kitchen. We enjoyed the building's BBQ and the pool/hot tub. The property manager was very helpful and easy to deal with. 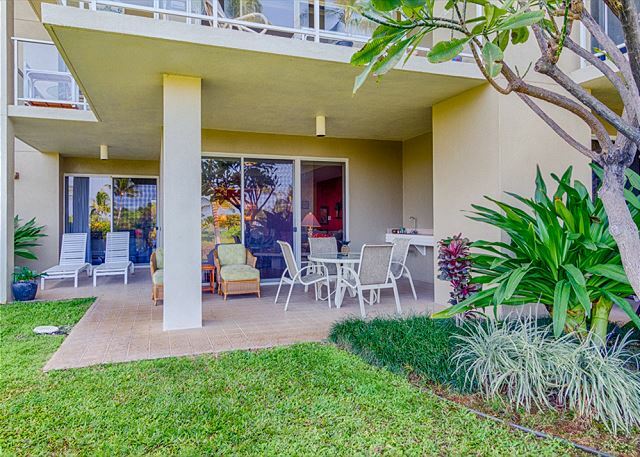 The condo is located conveniently close to gorgeous beaches. I would highly recommend this rental! Me, myhusband & som loved this place. Great location, great pool. We have stayed in the A104 for the second time already. The apartment is spacious and well equipped. In fact, we have not found a missed a single item in kitchen or bathroom. Moreover, the close in the children's bed room has a choice of boogie boards, snorkels, beach chairs, a cooling box etc. The apartment also has modern washer and dryer, detergent is provided. Beds are comfortable, and despite the (relatively short) proximity of the street to the Vista, the apartment is very silent. King's and Queen's market place are in walking distance (approx. 10 mins). In summary, we think that this unit will very well serve two adults and up to two children that expect more space and more freedom than any hotel room could offer. 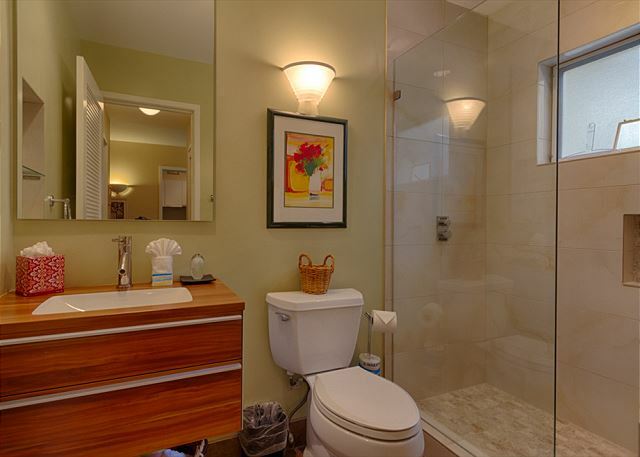 This condo was well taken care of with lovely updates to the bathrooms. 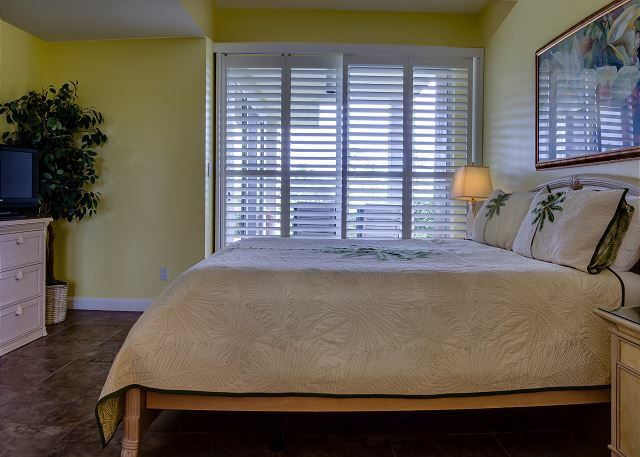 There are beach items that can be used in the condo and the beds and furniture are comfortable. I would stay in this unit anytime. Awesome location, beautiful clean condo, great patio! This condo was fabulous. Comfortable beds, beautiful bathrooms, clean and well supplied. The rental agent went above and beyond and was quick to reply to our questions and needs. Everything was even better than expected. 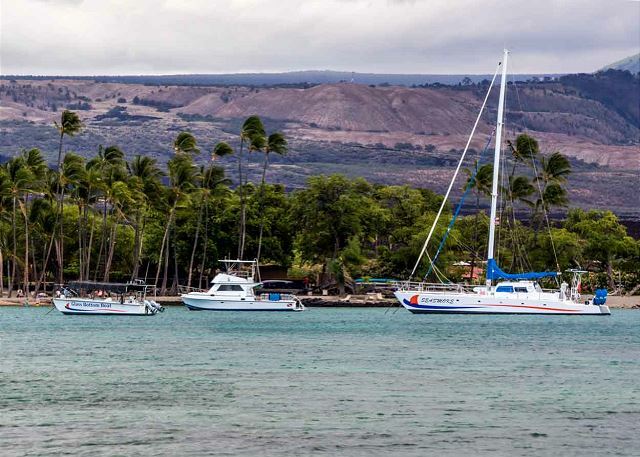 Loved walking through the Hilton, eating lunch at Lava Lava Beach Club, nightly entertainment at the Queens Marketplace, exploring all the beaches nearby and the peaceful home away from home!